What will happen with your CAD files in the cloud? To cloud or not to cloud? Few years ago, it was a question many engineering and manufacturing software companies were asking about. Not anymore. Now, the right question is “how to cloud”. Looking at CAD companies these days you can see all variety of cloud options and solutions. Full cloud, hybrid cloud, hosted cloud desktop… you name it. Hosted desktop is a simple and easy way to move to the cloud. First time I asked about it back in 2010 here. More detailed discussion about desktop virtualization and future cloud CAD platforms is here. CAD on the cloud has tremendous potential for companies. Oftentimes, suppliers encounter situations where they need additional CAD licenses—whether for a temporary increase in projects or a client that uses a different system than they do—but it doesn’t make sense to purchase them for long-term use. Or perhaps a company traditionally does not use CAD, but they have a special project in which CAD is required. Or, in the case of smaller companies, it may not be feasible to purchase the hardware and software required to do the job. In each of these cases, a pay-for-service cloud model is ideal. 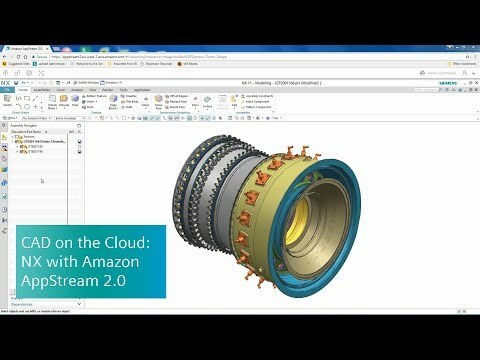 That is exactly what you get with NX on Amazon AppStream 2.0. The main benefit, of course, is that NX performs very much as if you were running the software on your own machine. Since you are installing and using NX on virtual machines on AWS, you do not have the admin and IT costs normally associated with having NX loaded locally on your machine. As a hosted service, you pay only for what you need and use.